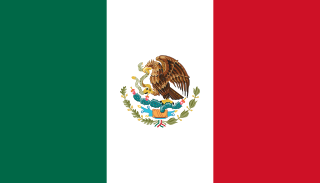 Mexico (Spanish : México [ˈmexiko] ( listen ); Nahuatl languages : Mēxihco), officially the United Mexican States (Spanish: Estados Unidos Mexicanos, listen (help·info)),     is a country in the southern portion of North America. It is bordered to the north by the United States; to the south and west by the Pacific Ocean; to the southeast by Guatemala, Belize, and the Caribbean Sea; and to the east by the Gulf of Mexico. Covering almost 2,000,000 square kilometres (770,000 sq mi),  the nation is the fifth largest country in the Americas by total area and the 13th largest independent state in the world. With an estimated population of over 120 million people,  the country is the eleventh most populous state and the most populous Spanish-speaking state in the world, while being the second most populous nation in Latin America after Brazil. Mexico is a federation comprising 31 states and Mexico City, a special federal entity that is also the capital city and its most populous city. 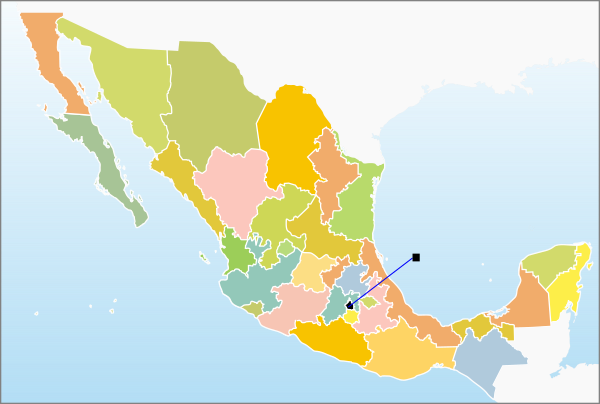 Other metropolises in the state include Guadalajara, Monterrey, Puebla, Toluca, Tijuana and León. The pre-Columbian history of the territory now comprising contemporary Mexico is known through the work of archaeologists and epigraphers, and through the accounts of the conquistadors, clergymen, and indigenous chroniclers of the immediate post-conquest period. While relatively few documents of the Mixtec and Aztec cultures of the Post-Classic period survived the Spanish conquest, more progress has been made in the area of Mayan archaeology and epigraphy. Mexico has the 15th largest nominal GDP and the 11th largest by purchasing power parity. 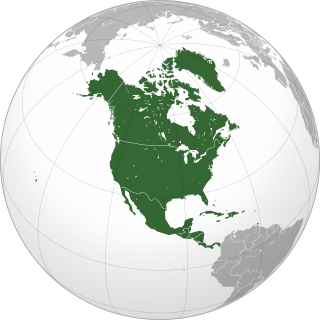 The Mexican economy is strongly linked to those of its 1994 North American Free Trade Agreement (NAFTA) partners, especially the United States. 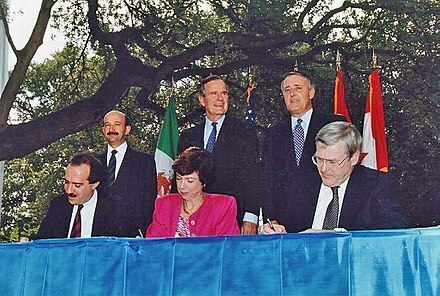 In 1994, Mexico became the first Latin American member of the Organisation for Economic Co-operation and Development (OECD). It is classified as an upper-middle income country by the World Bank  and a newly industrialized country by several analysts. The country is considered both a regional power and a middle power,     and is often identified as an emerging global power. Due to its rich culture and history, Mexico ranks first in the Americas and seventh in the world for number of UNESCO World Heritage Sites. Mexico is an ecologically megadiverse country, ranking fourth in the world for its biodiversity. Mexico receives a huge number of tourists every year: in 2018, it was the sixth most-visited country in the world, with 39 million international arrivals. Mexico is a member of the United Nations (UN), the World Trade Organization (WTO), the G8+5, the G20, the Uniting for Consensus group of the UN, and the Pacific Alliance trade bloc. Mēxihco is the Nahuatl term for the heartland of the Aztec Empire, namely the Valley of Mexico and surrounding territories, with its people being known as the Mexica, it is generally believed to be a toponym for the valley which became the primary ethnonym for the Aztec Triple Alliance as a result, although it could have been the other way around. In the colonial era, back when Mexico was called New Spain this territory became the Intendency of Mexico and after New Spain achieved independence from the Spanish Empire it came to be known as the State of Mexico with the new country being named after its capital: the City of Mexico, which itself was founded in 1524 on top of the ancient Mexica capital of Mexico-Tenochtitlan. Nahuatl, known historically as Aztec, is a language or group of languages of the Uto-Aztecan language family. Varieties of Nahuatl are spoken by about 1.7 million Nahua peoples, most of whom live in central Mexico. 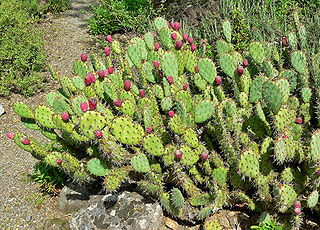 Opuntia, commonly called prickly pear, is a genus in the cactus family, Cactaceae. Prickly pears are also known as tuna (fruit), sabra, nopal from the Nahuatl word nōpalli for the pads, or nostle, from the Nahuatl word nōchtli for the fruit; or paddle cactus. The genus is named for the Ancient Greek city of Opus, where, according to Theophrastus, an edible plant grew and could be propagated by rooting its leaves. The most common culinary species is the Indian fig opuntia. The name of the city-state was transliterated to Spanish as México with the phonetic value of the letter x in Medieval Spanish, which represented the voiceless postalveolar fricative [ʃ]. This sound, as well as the voiced postalveolar fricative [ʒ], represented by a j, evolved into a voiceless velar fricative [x] during the 16th century. This led to the use of the variant Méjico in many publications in Spanish, most notably in Spain, whereas in Mexico and most other Spanish–speaking countries, México was the preferred spelling. In recent years, the Real Academia Española, which regulates the Spanish language, determined that both variants are acceptable in Spanish but that the normative recommended spelling is México. The majority of publications in all Spanish-speaking countries now adhere to the new norm, even though the alternative variant is still occasionally used. [ citation needed ] In English, the 'x' in Mexico represents neither the original nor the current sound, but the consonant cluster [ks]. The earliest complex civilization in Mexico was the Olmec culture, which flourished on the Gulf Coast from around 1500 BC. Olmec cultural traits diffused through Mexico into other formative-era cultures in Chiapas, Oaxaca and the Valley of Mexico. The formative period saw the spread of distinct religious and symbolic traditions, as well as artistic and architectural complexes. 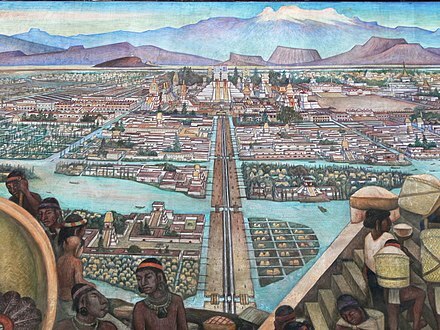 The formative-era of Mesoamerica is considered one of the six independent cradles of civilization. In Central Mexico, the height of the classic period saw the ascendancy of Teotihuacán, which formed a military and commercial empire whose political influence stretched south into the Maya area as well as north. Teotihuacan, with a population of more than 150,000 people, had some of the largest pyramidal structures in the pre-Columbian Americas. 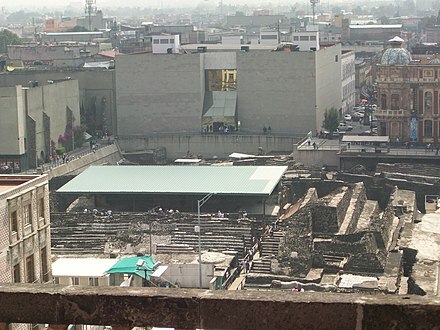 After the collapse of Teotihuacán around 600 AD, competition ensued between several important political centers in central Mexico such as Xochicalco and Cholula. 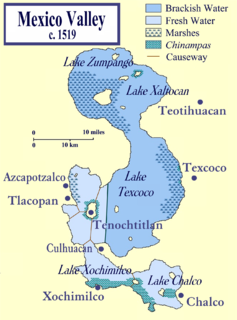 At this time, during the Epi-Classic, Nahua peoples began moving south into Mesoamerica from the North, and became politically and culturally dominant in central Mexico, as they displaced speakers of Oto-Manguean languages. 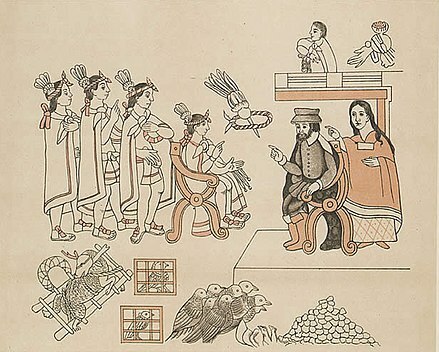 Image of Hernán Cortés and La Malinche meeting Moctezuma II from the Lienzo de Tlaxcala , created c. 1550 by the Tlaxcalans to remind the Spanish of their loyalty and the importance of Tlaxcala during the conquest. When the Spaniards arrived, the ruler of the Aztec empire was Moctezuma II, who was later killed. His successor and brother Cuitláhuac took control of the Aztec empire, but was among the first to fall from the first smallpox epidemic in the area a short time later. Unintentionally introduced by Spanish conquerors, among whom smallpox was endemic, the infectious disease ravaged Mesoamerica in the 1520s. It killed more than 3 million natives as they had no immunity. Other sources, however, mentioned that the death toll of the Aztecs might have reached 15 million (out of a population of less than 30 million) although such a high number conflicts with the 350,000 Aztecs who ruled an empire of 5 million or 10 million. 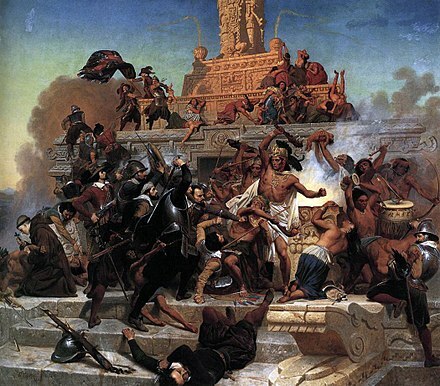 Severely weakened, the Aztec empire was easily defeated by Cortés and his forces on his second return with the help of state of Tlaxcala whose population estimate was 300,000. The native population declined 80–90% by 1600 to 1–2.5 million. Any population estimate of pre-Columbian Mexico is bound to be a guess but 8–12 million is often suggested for the area encompassed by the modern nation. Colonial law with Spanish roots was introduced and attached to native customs creating a hierarchy between local jurisdiction (the Cabildos) and the Spanish Crown. Upper administrative offices were closed to native-born people, even those of pure Spanish blood (criollos). Administration was based on the racial separation, among "Republics" of Spaniards, Amerindians and castas , autonomous and directly dependent on the king himself. The Council of Indies and the mendicant religious orders, which arrived in Mesoamerica as early as 1524, labored to generate capital for the crown of Spain and convert the Amerindian populations to Catholicism. The 1531 Marian apparitions to Saint Juan Diego gave impetus to the evangelization of central Mexico. The Virgin of Guadalupe became a symbol of criollo patriotism  and was used by the insurgents that followed Miguel Hidalgo during the War of Independence. Some Crypto-Jewish families emigrated to Mexico to escape the Spanish Inquisition. As a result of its trade links with Asia, the rest of the Americas, Africa and Europe and the profound effect of New World silver, central Mexico was one of the first regions to be incorporated into a globalized economy. Being at the crossroads of trade, people and cultures, Mexico City has been called the "first world city". 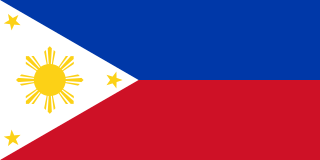 The Nao de China (Manila Galleons) operated for two and a half centuries and connected New Spain with Asia. Goods were taken from Veracruz to Atlantic ports in the Americas and Spain. Veracruz was also the main port of entry in mainland New Spain for European goods, immigrants, and African slaves. The Camino Real de Tierra Adentro connected Mexico City with the interior of New Spain. Mexican silver pesos became the first globally used currency and the silver mined in Mexico were used to run commerce and wage crusades in two sides of globe, at the Mediterranean were Spain fought against the Ottoman Caliphate and at Southeast Asia where the Philippines fought against the Brunei Sultanate. Guanajuato City became the world's leading silver producer in the 18th century as a result of the veta madre . On September 16, 1810, a "loyalist revolt" against the ruling junta was declared by priest Miguel Hidalgo y Costilla, in the small town of Dolores, Guanajuato. This event, known as the Cry of Dolores (Spanish: Grito de Dolores) is commemorated each year, on September 16, as Mexico's independence day. The first insurgent group was formed by Hidalgo, the Spanish viceregal army captain Ignacio Allende, the militia captain Juan Aldama and "La Corregidora" Josefa Ortiz de Domínguez. Hidalgo and some of his soldiers were captured and executed by firing squad in Chihuahua, on July 31, 1811. Following his death, the leadership was assumed by priest José María Morelos, who occupied key southern cities. Dissatisfaction with Santa Anna's return to power led to the liberal "Plan of Ayutla", initiating an era known as La Reforma. The new Constitution drafted in 1857 established a secular state, federalism as the form of government, and several freedoms. As the Conservatives refused to recognize it, the Reform War began in 1858, during which both groups had their own governments. 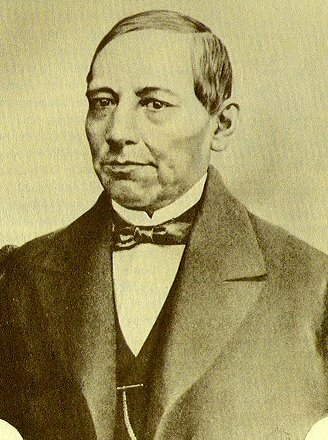 The war ended in 1861 with victory by the Liberals, led by president Benito Juárez, who was an ethnic Zapotec. Díaz ruled with a group of confidants that became known as the científicos ("scientists"). The most influential cientifco was Secretary of Finance José Yves Limantour. The Porfirian regime was influenced by positivism. They rejected theology and idealism in favor of scientific methods being applied towards national development. Various iconic buildings and monuments were initiated by Díaz, including the Palacio de Bellas Artes, Palacio de Correos de Mexico, Monumento a la Independencia and the Palacio Legislativo (which became the Monumento a la Revolución). On the day of the summit, Frederick Russell Burnham, the celebrated scout, and Private C.R. Moore, a Texas Ranger, discovered a man holding a concealed palm pistol standing at the El Paso Chamber of Commerce building along the procession route, and they disarmed the assassin within only a few feet of Díaz and Taft. Both presidents were unharmed and the summit was held. 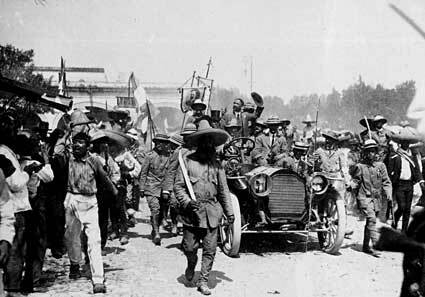 Díaz was re-elected in 1910, but alleged electoral fraud forced him into exile in France and sparked the 1910 Mexican Revolution, initially led by Francisco I. Madero. Electoral reforms and high oil prices followed the administration of Luis Echeverría,   mismanagement of these revenues led to inflation and exacerbated the 1982 Crisis. That year, oil prices plunged, interest rates soared, and the government defaulted on its debt. President Miguel de la Madrid resorted to currency devaluations which in turn sparked inflation. Mexico's total area is 1,972,550 km2 (761,606 sq mi), making it the world's 13th largest country by total area. It has coastlines on the Pacific Ocean and Gulf of California, as well as the Gulf of Mexico and Caribbean Sea, the latter two forming part of the Atlantic Ocean. Within these seas are about 6,000 km2 (2,317 sq mi) of islands (including the remote Pacific Guadalupe Island and the Revillagigedo Islands). From its farthest land points, Mexico is a little over 2,000 mi (3,219 km) in length. In 2002 [update] , Mexico had the second fastest rate of deforestation in the world, second only to Brazil. The government has taken another initiative in the late 1990s to broaden the people's knowledge, interest and use of the country's esteemed biodiversity, through the Comisión Nacional para el Conocimiento y Uso de la Biodiversidad. 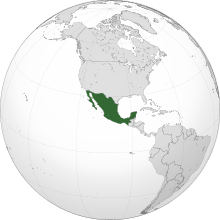 The United Mexican States are a federation whose government is representative, democratic and republican based on a presidential system according to the 1917 Constitution. The constitution establishes three levels of government: the federal Union, the state governments and the municipal governments. According to the constitution, all constituent states of the federation must have a republican form of government composed of three branches: the executive, represented by a governor and an appointed cabinet, the legislative branch constituted by a unicameral congress  [ original research? ] and the judiciary, which will include a state Supreme Court of Justice. They also have their own civil and judicial codes. Three parties have historically been the dominant parties in Mexican politics: the National Action Party: a conservative party founded in 1939 and belonging to the Christian Democrat Organization of America;  the Institutional Revolutionary Party, a center-left party and member of Socialist International  that was founded in 1929 to unite all the factions of the Mexican Revolution and held an almost hegemonic power in Mexican politics since then; the Party of the Democratic Revolution: a left-wing party,  founded in 1989 as the successor of the coalition of socialists and liberal parties. Mexico has the 15th largest nominal GDP and the 11th largest by purchasing power parity. GDP annual average growth for the period of 1995–2002 was 5.1%. Mexico's Gross Domestic Product (GDP) in purchasing power parity (PPP) was estimated at US$2.2602 trillion in 2015, and $1.3673 trillion in nominal exchange rates. Mexico's GDP in PPP per capita was US$18,714.05. The World Bank reported in 2009 that the country's Gross National Income in market exchange rates was the second highest in Latin America, after Brazil at US$1,830.392 billion,  which lead to the highest income per capita in the region at $15,311. Mexico is now firmly established as an upper middle-income country. After the slowdown of 2001 the country has recovered and has grown 4.2, 3.0 and 4.8 percent in 2004, 2005 and 2006,  even though it is considered to be well below Mexico's potential growth. Furthermore, after the 2008–2009 recession, the economy grew an average of 3.32 percent per year from 2010 to 2014. The telecommunications industry is mostly dominated by Telmex (Teléfonos de México), privatized in 1990. By 2006, Telmex had expanded its operations to Colombia, Peru, Chile, Argentina, Brazil and Uruguay and the United States. Other players in the domestic industry are Axtel and Maxcom. Because of Mexican orography, providing a landline telephone service at remote mountainous areas is expensive, and the penetration of line-phones per capita is low compared to other Latin American countries, at 40 percent; however, 82% of Mexicans over the age of 14 own a mobile phone. Mobile telephony has the advantage of reaching all areas at a lower cost, and the total number of mobile lines is almost two times that of landlines, with an estimation of 63 million lines. The telecommunication industry is regulated by the government through Cofetel (Comisión Federal de Telecomunicaciones). The Mexican satellite system is domestic and operates 120 earth stations. There is also extensive microwave radio relay network and considerable use of fiber-optic and coaxial cable. Mexican satellites are operated by Satélites Mexicanos (Satmex), a private company, leader in Latin America and servicing both North and South America. It offers broadcast, telephone and telecommunication services to 37 countries in the Americas, from Canada to Argentina. Through business partnerships Satmex provides high-speed connectivity to ISPs and Digital Broadcast Services. 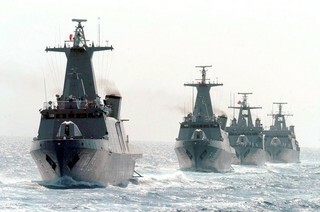 Satmex maintains its own satellite fleet with most of the fleet being designed and built in Mexico. 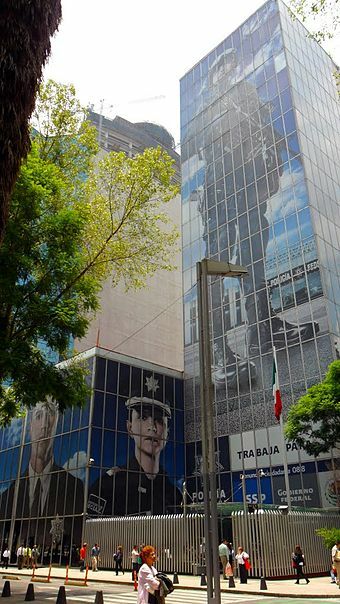 Major players in the broadcasting industry are Televisa, the largest Mexican media company in the Spanish-speaking world,  TV Azteca and Imagen Televisión. The project named SEGH-CFE 1, located in Puerto Libertad, Sonora, Northwest of Mexico, will have capacity of 46.8 MW from an array of 187,200 solar panels when complete in 2013. All of the electricity will be sold directly to the CFE and absorbed into the utility's transmission system for distribution throughout their existing network. At an installed capacity of 46.8 MWp, when complete in 2013, the project will be the first utility scale project of its kind in Mexico and the largest solar project of any kind in Latin America. The National Autonomous University of Mexico was officially established in 1910,  and the university became one of the most important institutes of higher learning in Mexico. UNAM provides world class education in science, medicine, and engineering. Many scientific institutes and new institutes of higher learning, such as National Polytechnic Institute (founded in 1936),  were established during the first half of the 20th century. Most of the new research institutes were created within UNAM. Twelve institutes were integrated into UNAM from 1929 to 1973. In 1959, the Mexican Academy of Sciences was created to coordinate scientific efforts between academics. In recent years, the largest scientific project being developed in Mexico was the construction of the Large Millimeter Telescope (Gran Telescopio Milimétrico, GMT), the world's largest and most sensitive single-aperture telescope in its frequency range. It was designed to observe regions of space obscured by stellar dust. At the southern tip of the Baja California peninsula is the resort town of Cabo San Lucas, a town noted for its beaches and marlin fishing. Further north along the Sea of Cortés is the Bahía de La Concepción, another beach town known for its sports fishing. Closer to the United States border is the weekend draw of San Felipe, Baja California. The challenges include water scarcity in the northern and central parts of the country; inadequate water service quality (drinking water quality; 11% of Mexicans receiving water only intermittently as of 2014);  poor technical and commercial efficiency of most utilities (with an average level of non-revenue water of 43.2% in 2010);  an insufficient share of wastewater receiving treatment (36% in 2006); and still inadequate access in rural areas. In addition to on-going investments to expand access, the government has embarked on a large investment program to improve wastewater treatment. According to estimations made by Mexico's National Geography and Statistics Institute, as of 2017 Mexico has 123.5 million inhabitants  making it the most populous Spanish-speaking country in the world. Between 2005 and 2010, the Mexican population grew at an average of 1.70% per year, up from 1.16% per year between 2000 and 2005. Even though Mexico is a very ethnically diverse country, research about ethnicity has largely been a forgotten field, in consequence of the post-revolutionary efforts of Mexico's government to unify all non-indigenous Mexicans under a single ethnic identity (that of the "Mestizo"). As a result, since 1930 the only explicit ethnic classification that has been included in Mexican censuses has been that of "Indigenous peoples". Even then, across the years the government has used different criteria to count Indigenous peoples, with each of them returning considerably different numbers. It is not until very recently that the Mexican government begun conducting surveys that considered the Afro-Mexican and Euro-Mexican population that lives in the country. The Afro-Mexican population (1,381,853 individuals as of 2015 [update] )  is an ethnic group made up of descendants of Colonial-era slaves and recent immigrants of sub-Saharan African descent. Mexico had an active slave trade during the colonial period, and some 200,000 Africans were taken there, primarily in the 17th century. The creation of a national Mexican identity, especially after the Mexican Revolution, emphasized Mexico's indigenous and European past; it passively eliminated the African ancestors and contributions. Most of the African-descended population was absorbed into the surrounding Mestizo (mixed European/indigenous) and indigenous populations through unions among the groups. Evidence of this long history of intermarriage with Mestizo and indigenous Mexicans is also expressed in the fact that in the 2015 inter-census, 64.9% (896,829) of Afro-Mexicans also identified as indigenous. It was also reported that 9.3% of Afro-Mexicans speak an indigenous language. The states with the highest self-report of Afro-Mexicans were Guerrero (6.5% of the population), Oaxaca (4.95%) and Veracruz (3.28%). Afro-Mexican culture is strongest in the communities of the Costa Chica of Oaxaca and Costa Chica of Guerrero. The first census in Mexico (then known as New Spain) that included an ethnic classification was the 1793 census. Also known as the Revillagigedo census. Most of its original datasets have reportedly been lost, thus most of what is known about it nowadays comes from essays and field investigations made by academics who had access to the census data and used it as reference for their works such as Prussian geographer Alexander von Humboldt. According to said works Europeans ranged from 18% to 22% of New Spain's population, Mestizos from 21% to 25%, Indians from 51% to 61% and Africans were between 6,000 and 10,000. The total population ranged from 3,799,561 to 6,122,354. It is concluded that the population growth trends of whites and mestizos were even, while the percentage of the indigenous population decreased at a rate of 13%–17% per century mostly due the later having higher mortality rates for living in remote locations and being in constant war with the colonists. Anthropologist Gonzalo Aguirre Beltrán goes beyond said numbers and splits the Mestizo group into "Euromestizos", "Indomestizos" and "Afromestizos" calculating their numbers at more than one million, 700,000 and 600,000 respectively. Independent-era Mexico eliminated the legal basis of the Colonial caste system which led to exclusion of racial classification in the censuses to come. The 92,924,489  Catholics of Mexico constitute in absolute terms the second largest Catholic community in the world, after Brazil's. 47% percent of them attend church services weekly. The feast day of Our Lady of Guadalupe, the patron saint of Mexico, is celebrated on December 12 and is regarded by many Mexicans as the most important religious holiday of their country. In spite of this, the Mexican State is officially lay secularist since the separation between religious institutions and the political administration of the nation was enshrined in the 1857, and was ratified in the current Constitution of 1917. José María Morelos noted in his writings that there should be no tolerance for any other religion and the Constitution of 1824 declared that the official religion of the Republic would be Catholic, and from the second half of the 20th century, began a process of introducing creeds different from the Catholic. According to the figures of INEGI, most Mexicans declare themselves Christian and most Catholics (almost 93 million adherents according to the census of 2010). The second Christian group is the Jehovah's Witnesses, which totals more than 1 million adherents, making the Mexican congregation of this Christian branch the second worldwide. [ citation needed ] Thirdly find The Church of Jesus Christ of Latter-day Saints, whose members are known as Mormons, 2010 census reported 314,932 members of The Church of Jesus Christ of Latter-day Saints,  though the church in 2009 claimed to have over one million registered members;  followed by Church of the La Luz del Mundo, which has its center in "La Hermosa Provincia", a colony of Guadalajara. The denominations Pentecostal also have an important presence, especially in the cities of the border and in the indigenous communities. In fact, Pentecostal churches together have more than 1.3 million adherents, which in net numbers place them as the second Christian creed in Mexico. The situation changes when the different Pentecostal denominations are considered as separate entities. Other groups are growing, such as Iglesia apostólica de la Fe en Cristo Jesús, Mennonites and Seventh-day Adventist Church. Migratory phenomena have led to the proliferation of different aspects of Christianity, including branches Protestants, Eastern Catholic Churches and Eastern Orthodox Church. In certain regions, the profession of a creed other than the Catholic is seen as a threat to community unity. It is argued that the Catholic religion is part of the ethnic identity, and that the Protestants are not willing to participate in the traditional customs and practices (the tequio or community work, participation in the festivities and similar issues). The refusal of the Protestants is because their religious beliefs do not allow them to participate in the cult of images. In extreme cases, tension between Catholics and Protestants has led to the expulsion or even murder of Protestants in several villages. The best known cases are those of San Juan Chamula,   in Chiapas, and San Nicolás, in Ixmiquilpan,  Hidalgo. The presence of Jews in Mexico dates back to 1521, when Hernán Cortés conquered the Aztecs, accompanied by several Conversos. 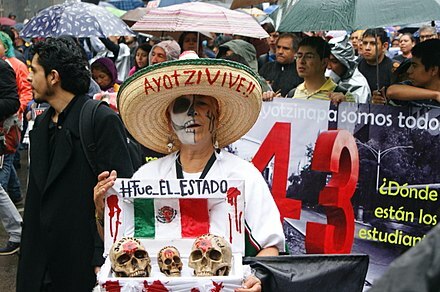 According to the 2010 census, there are 67,476 Jews in Mexico. Islam in Mexico is practiced mostly by Arab Mexicans. In the 2010 census 18,185 Mexicans reported belonging to an Eastern religion,  a category which includes a tiny Buddhist population. Mexican culture reflects the complexity of the country's history through the blending of indigenous cultures and the culture of Spain, imparted during Spain's 300-year occupation of Mexico. Exogenous cultural elements have been incorporated into Mexican culture as time has passed. Modern architecture in Mexico has an important development in the plasticity of form and space, José Villagrán García develops a theory of form that sets the pattern of teaching in many schools of architecture in the country within functionalism. The emergence of the new Mexican architecture was born as a formal order of the policies of a nationalist state that sought modernity and the differentiation of other nations. Juan O'Gorman was one of the first environmental architects in Mexico, developing the "organic" theory, trying to integrate the building with the landscape within the same approaches of Frank Lloyd Wright. In the search for a new architecture that does not resemble the styles of the past, it achieves a joint manifestation with the mural painting and the landscaping. In ethnic and cultural terms, Lo mexicano corresponds only to everything that is referred to the Aztec culture; therefore, ethnically Mexicans are those who are also known as Nahuas and whose language is Nahuatl. There is a strong discussion to define The Mexican (Lo mexicano); there are two completely divided aspects: ethnic and cultural, which focuses exclusively on the Mesoamerican people called Mexica people, and the legal-administrative aspect of the territory called Mexico. In legal terms and in accordance with the Constitution, a Mexican is a citizen born within the territory of the United Mexican States or whoever has decided adopt the Mexican citizenship. The intellectual construction of the mestizo is in dialogue with the triumph of revolutionary nationalism, which was born after the Mexican Revolution. In the reflection on the subject (the character of the Mexican, the mexicanity, the definition of a Mexican) have participated, among others: José Vasconcelos,  Samuel Ramos,  Emilio Uranga,  José Gaos, Leopoldo Zea, Jorge Portilla, Santiago Ramírez, Salvador Pérez Nevares, Roger Bartra, José del Val, Arturo Warman, Aniceto Aramoni, Rogelio Díaz Guerrero, Ezequiel Adeodato Chávez Lavista, Mauro Rodríguez Estrada and Carlos Chilpa Navarrete. In this specific topic, occupies a privileged place Octavio Paz, author of The Labyrinth of Solitude . Post-revolutionary art in Mexico had its expression in the works of renowned artists such as David Alfaro Siqueiros, Federico Cantú Garza, Frida Kahlo, Juan O'Gorman, José Clemente Orozco, Diego Rivera, and Rufino Tamayo. Diego Rivera, the most well-known figure of Mexican muralism, painted the Man at the Crossroads at the Rockefeller Center in New York City, a huge mural that was destroyed the next year because of the inclusion of a portrait of Russian communist leader Lenin. Some of Rivera's murals are displayed at the Mexican National Palace and the Palace of Fine Arts. More recently, films such as Como agua para chocolate (1992), Cronos (1993), Y tu mamá también (2001), and Pan's Labyrinth (2006) have been successful in creating universal stories about contemporary subjects, and were internationally recognized, as in the prestigious Cannes Film Festival. Mexican directors Alejandro González Iñárritu ( Amores perros , Babel , Birdman , The Revenant ), Alfonso Cuarón ( Children of Men , Harry Potter and the Prisoner of Azkaban , Gravity ), Guillermo del Toro, Carlos Carrera ( The Crime of Father Amaro ), screenwriter Guillermo Arriaga and photographer Emmanuel Lubezki are some of the most known present-day film makers. There are three major television companies in Mexico that own the primary networks and broadcast covering all nation, Televisa, TV Azteca and Imagen Television. Televisa is also the largest producer of Spanish-language content in the world and also the world's largest Spanish-language media network. Media company Grupo Imagen is another national coverage television broadcaster in Mexico, that also owns the newspaper Excélsior. Grupo Multimedios is another media conglomerate with Spanish-language broadcasting in Mexico, Spain, and the United States. The telenovelas are very traditional in Mexico and are translated to many languages and seen all over the world with renowned names like Verónica Castro, Lucía Méndez and Thalía. The origin of the current Mexican cuisine is established during the Spanish colonization, being a mixture of the foods of Spain with native indigenous ingredients. Of foods originated in Mexico is the corn, the pepper vegetables (together with Central and South America), calabazas (together with the Americas), avocados, sweet potato (together with Central and South America), the turkey (together with the Americas) and other fruits and spices. Other Indigenous products are many beans. Similarly, some cooking techniques used today are inherited from pre-Hispanic peoples, such as the nixtamalization of corn, the cooking of food in ovens at ground level, grinding in molcajete and metate. With the Spaniards came the pork, beef and chicken meats; peppercorn, sugar, milk and all its derivatives, wheat and rice, citrus fruits and another constellation of ingredients that are part of the daily diet of Mexicans. The Mexican professional baseball league is named the Liga Mexicana de Beisbol. 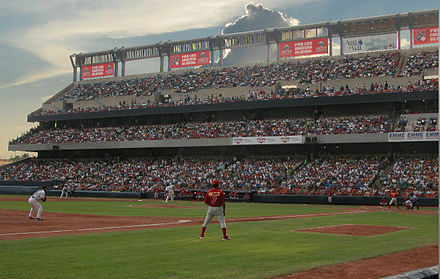 While usually not as strong as the United States, the Caribbean countries and Japan, Mexico has nonetheless achieved several international baseball titles. [ citation needed ] Mexican teams have won the Caribbean Series nine times. Mexico has had several players signed by Major League teams, the most famous of them being Dodgers pitcher Fernando Valenzuela. Notable Mexican athletes include golfer Lorena Ochoa, who was ranked first in the LPGA world rankings prior to her retirement,  Ana Guevara, former world champion of the 400 metres (1,300 ft) and Olympic subchampion in Athens 2004, Fernando Platas, four-time Olympic medal winning diver, and taekwondo fighter María Espinoza, most decorated Mexican female Olympian. The current coat of arms of Mexico (Spanish : Escudo Nacional de México, literally "national shield of Mexico") has been an important symbol of politics and culture of Mexico for centuries. It depicts a Mexican golden eagle perched on a prickly pear cactus devouring a rattlesnake. The design is rooted in the legend that the Aztec people would know where to build their city once they saw an eagle eating a snake on top of a lake. To the people of Tenochtitlan, this symbol had strong religious connotations, and to the Europeans, it came to symbolize the triumph of good over evil (with the snake sometimes representative of the serpent in the Garden of Eden). Since the early 1990s, Mexico entered a transitional stage in the health of its population and some indicators such as mortality patterns are identical to those found in highly developed countries like Germany or Japan. Mexico's medical infrastructure is highly rated for the most part and is usually excellent in major cities,   but rural communities still lack equipment for advanced medical procedures, forcing patients in those locations to travel to the closest urban areas to get specialized medical care. Social determinants of health can be used to evaluate the state of health in Mexico. This article is about the demographic features of the population of Costa Rica, including population density, ethnicity, education level, health of the populace, economic status, religious affiliations and other aspects of the population. 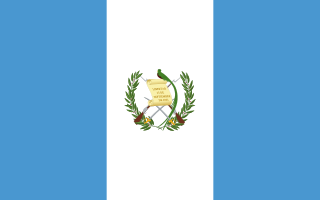 Guatemalan people are people identified with Guatemala, a multiethnic country in Central America. Guatemalans are mainly of Mestizos, indigenous people or Amerindians and descendants from European people. Guatemalans are also nicknamed chapines by other mainly Spanish-speaking countries of the Latin America. Indigenous peoples of Mexico, Native Mexicans, or Mexican Native Americans, are those who are part of communities that trace their roots back to populations and communities that existed in what is now Mexico prior to the arrival of Europeans. The Salvadorans are people who identify with El Salvador in Central America. Salvadorans are mainly Mestizos who make up the bulk of the population in El Salvador. Most Salvadorans live in El Salvador, although there is also a significant Salvadoran diaspora, particularly in the United States, with smaller communities in other countries around the world. This article is about the demographic features of the population of Colombia, including population density, ethnicity, education level, health of the populace, economic status, religious affiliations and other aspects of the population. It is the second-most populous country in South America after Brazil. 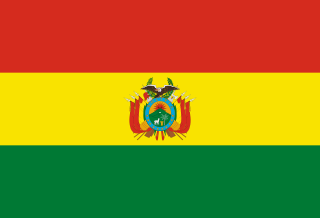 Bolivians are the people that inhabit Bolivia. Amerindians lived in what is now called Bolivia for several millennia before the Spanish Conquest in the 16th century. Spaniards mixed with enslaved Africans in steady numbers, mixing widely with each other and with indigenous peoples. In Mexico, the term Mestizo is used to refer to an ethnic group that can be defined by different criteria, namely a cultural criterion or a more strict biological criterion. Because of this, estimates of the number of Mestizos in Mexico do vary. ↑ "Indicadores demográficos de México de 1950 a 2050" (in Spanish). Consejo Nacional de Población. Retrieved April 3, 2019. ↑ "CONEVAL INFORMA LA EVOLUCIÓN DE LA POBREZA 2010-2016" (PDF). CONEVAL. August 30, 2017. Retrieved February 25, 2019. ↑ "Human Development Report 2018 – "Human Development Indices and Indicators"" (PDF). HDRO (Human Development Report Office) United Nations Development Programme. p. 23. Retrieved September 14, 2018. ↑ "Official name of the country". Presidency of Mexico. March 31, 2005. Archived from the original on March 26, 2010. Retrieved March 26, 2010. 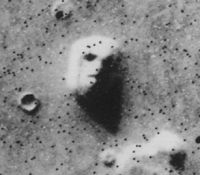 1 2 3 "Mexico". The World Factbook . Central Intelligence Agency. ↑ "Oxford Analytica". Archived from the original on April 24, 2007. Retrieved July 17, 2013. ↑ "México ocupa el sexto lugar en turismo a nivel mundial". www.expansion.mx. CNN Expansión. Retrieved January 8, 2019. ↑ Colin M. MacLachlan (April 13, 2015). Imperialism and the Origins of Mexican Culture. Harvard University Press. p. 39. ISBN 978-0-674-28643-6. ↑ Cowgill, George (1997). "State and Society at Teotihuacan, Mexico". Annual Review of Anthropology . 26 (1): 129–161. doi:10.1146/annurev.anthro.26.1.129. ISSN 0084-6570. OCLC 202300854. ↑ "The Enigma of Aztec Sacrifice". Natural History . Retrieved December 16, 2011. ↑ Baker, Andy (2013). Shaping the Developing World: The West, the South, and the Natural World. p. 324. ISBN 9781483311081. ↑ Sluyter, Andrew (2012). Black Ranching Frontiers: African Cattle Herders of the Atlantic World, 1500–1900. Yale University Press. p. 240. ISBN 9780300179927 . Retrieved October 8, 2016. ↑ Russell, James W. (2009). Class and Race Formation in North America. University of Toronto Press. p. 26. ISBN 9780802096784 . Retrieved December 13, 2016. ↑ Ortiz-Ramirez, Eduardo A. The Virgin of Guadalupe and Mexican Nationalism: Expressions of Criollo Patriotism in Colonial Images of the Virgin of Guadalupe. ProQuest. p. 6. ISBN 9780549596509 . Retrieved February 9, 2017. ↑ "Grito de Dolores". Encyclopaedia Britannica . Retrieved September 12, 2018. ↑ "Ways of ending slavery". Encyclopædia Britannica . ↑ McCarthy, Robert J. (Spring 2011). "Executive Authority, Adaptive Treaty Interpretation, And The International Boundary And Water Commission, US — Mexico". University of Denver Water Law Review (197). SSRN 1839903 . ↑ Nicholas A. Robins; Adam Jones (2009). Genocides by the Oppressed: Subaltern Genocide in Theory and Practice. Indiana University Press. p. 50. ISBN 978-0-253-22077-6 . Retrieved July 17, 2013. ↑ Reed, Nelson A. (2001). The Caste War of Yucatán. Stanford University Press. ISBN 978-0-8047-4001-2 . Retrieved July 17, 2013. 1 2 3 4 Harris, Charles H. III; Sadler, Louis R. (2009). The Secret War in El Paso: Mexican Revolutionary Intrigue, 1906–1920. Albuquerque, New Mexico: University of New Mexico Press. pp. 1–17, 213. ISBN 978-0-8263-4652-0. ↑ Krauze, Enrique (January – February 2006). "Furthering Democracy in Mexico". Foreign Affairs. Archived from the original on January 10, 2006. Retrieved October 7, 2007. ↑ Vargas, Jorge A. (2011). 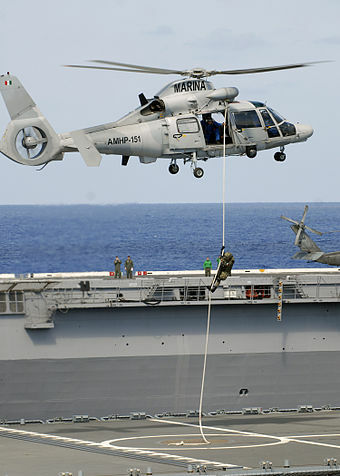 Mexico and the Law of the Sea: Contributions and Compromises. p. 405. ISBN 9789004206205. ↑ https://www.sipuebla.com. "Living México – The most complete online guide for information on Mexico". www.livingmexico.com. Retrieved January 27, 2019. ↑ "Entrevista a la Lic. Beatriz Paredes Rangel, Presidenta dle Comité Ejecutivo Nacional del PRI". December 17, 2008. Archived from the original on December 17, 2008. Retrieved July 17, 2013. ↑ "Agencia Federal de Investigacion. Procuraduría General de la República". May 1, 2007. Archived from the original on May 1, 2007. Retrieved July 17, 2013. ↑ "Freedom of Expression in Mexico". PEN American Center. Archived from the original on July 23, 2013. ↑ Alcázar, Jesús (July 17, 2014). "Más de 100 periodistas asesinados en México desde el año 2000" (in Spanish). El Mundo (Spain). EFE. ↑ "Buque logístico multipropósito" (in Spanish). November 11, 2004. Archived from the original on November 11, 2004. Retrieved July 17, 2013.